What Are These Little Grey Cells? Your Brain Is A Living Organ, Made From Living Cells. It must be made clear that the brain is a living organ. It is part of you, relies on your body for sustenance. It will die with you too. Because the one real distinction one can make between a computer and your brain is that one is alive and the other isn’t. This may sound trivial, given that both process information. Take a more careful look – as we will – and you will begin to see the immense power your brain has compared even to the most powerful super-computer. Yet little of what your brain does has to do with intelligence, nor does it have to do with process or information. The real power of your brain – your thinking – has in reality, very little to do with information at all. Information is important, and there is no denying this, the real power of your brain is in handling it. This side-steps any thoughts of “intelligence” – using your brain with the care with which it was made will show you just how unimportant such thoughts about intelligence really are. Let us start however, with the architecture of your brain, and we will be comparing it with the network of computers we call the internet. That the latter is unbelievably powerful is perhaps to pull the rabbit out of the hat too soon. Now your brain looks something like the top half of a huge walnut, or chestnut. However the colour is pale and not very interesting, a dull browny grey. It certainly lacks the colours in the diagrams! Of all the organs in the human, it is perhaps the least interesting to look at. Ranking above perhaps the liver, and below the kidneys! Even so, the furrows in its surface and its size are unique to you. Interestingly, intelligence has little to do with the physical size of your brain. People with big brains can seem stupid and small people with smaller brains can be as bright as sparks. There simply is no relationship between the size of your brain and your ability to think. Stay still for a moment and forget the weightlessness for now. Now you will sort-of feel your thinking in an area above and behind where your eyes are. This is your frontal cortex, and your ability to deal with the world we live in is closely tied to the large size of this part of our brain. The frontal cortex is almost absent in most animals. Sure, elephants have big brains, their frontal cortex is tiny. Chimpanzees have one that is a quarter of the size. Even allowing for their smaller brain and body size. Yours has a size that dwarfs anything else on our planet. 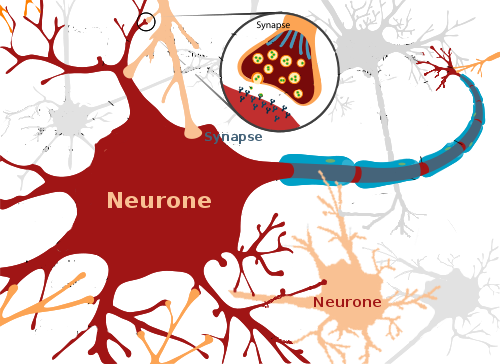 Neurons and Synapses: Computers And Processors. The Neuron Is No Transistor. The most active cells in the brain are the neurons and you have around a hundred billion of them. That in itself is not so fantastic in these days of super computers that have easily as many. Most of us think of a neuron as being some kind of transistor, something electrical, just a switch. Only neurons are interconnected by reflexive paths that end in synapses. It gets better: each one of your neurons can have as many as thirty thousand connections. Compared to even a modern transistor, that is impressive. Fan-out – which is the transistor equivalent of the neurone’s interconnections – is one of the most pressing problems in modern electronics. Now each synapse is actually made up of tiny connections, around a thousand of them. Each of these points could be compared to a transistor – albeit a living one. That means each synapse has processing power in its own right – no small deal when you think that each and every neuron has thirty thousand of them. Are you beginning to think big, because I am. One neuron on its own is a powerful processor of information. You have a hundred billion of them. Previous Post Three Pounds Of Brain. (That’s 1500g To You And Me). Next Post Your Brain: A Masterpiece Of Hard Wiring.